As with any ANOVA, repeated measures ANOVA is used for comparing three or more means .However, repeated measures ANOVA is used when all subjects are measured under a number of different conditions. As the subject is exposed to each condition in turn , the measurement of the dependent variable is repeated .Using a standard ANOVA in this case result in inappropriate even incorrect conclusion ,because it fails to model the correlation between the repeated measures: the data violate the ANOVA assumption of independence. If any repeated factor is present, then repeated measures ANOVA should be used. In addition to determining that differences exist among the means, the repeated measurements ANOVA procedure provides multiple means comparisons that identify which particular means are different. One-way Repeated Measures ANOVA with one repeated-measures factor. Two-way Repeated Measures ANOVA with two repeated-measures factor. Two-way Mixed-Design The two-way mixed-design is also known as two way split-plot design (SPANOVA). It is ANOVA with one repeated-measures factor and one between-groups factor. 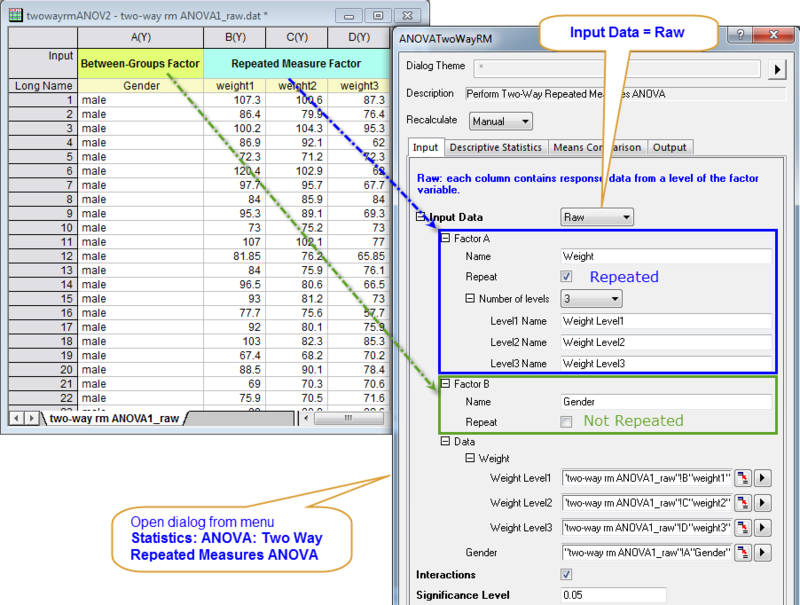 In the versions before Origin 2015, Repeated measures ANOVA in Origin requires that sample data are balanced, that is, equal size at each level. Missing values are excluded in analysis and data will be handled as unbalanced with this algorithm.